First let me say I’m not a big Fortran user but any blog posts about Fortran always seem to be very popular, and I do get asked regularly about how to compile Fortran applications. If you have followed the instructions on Cheminformatics on a Mac you already have Xcode, Command Line tools and gfortran installed using Homebrew. Alternatively you can install GCC 6.2 (auto-vectorizing gcc with OpenMP) which includes gfortran (free, open source, GNU Fortran 95 compiler), gcc (GNU C) and g++ (GNU C++) compilers that can perform auto-vectorization (i.e. modify code to take advantage of AltiVec/SSE, automatically) and other sophisticated optimizations like OpenMP. There are detailed instructions here, last updated Sept 2016 (El Capitan & Sierra). Portland group also has a commercial fortran compiler as part of their offerings (PGI). Details of compatibility with the latest versions of mac OSX are available here. The newest update to PGI Fortran, C and C++ compilers & tools for scientists and engineers. Includes Volta support, using CUDA Unified Memory with OpenACC, Open 4.5 CPU support, C++14 lambda and capture support within OpenACC and…. On Intel Haswell CPUs with OpenMP, PGI delivers multicore performance more than 50% faster than the latest GCC compilers. That’s like buying a cluster with 50% more compute nodes. PGI compilers deliver world-class multicore CPU performance and accelerator programming features that can dramatically increase the performance of applications on GPU accelerators. Absoft Pro Fortran 2018 for MacOSX. 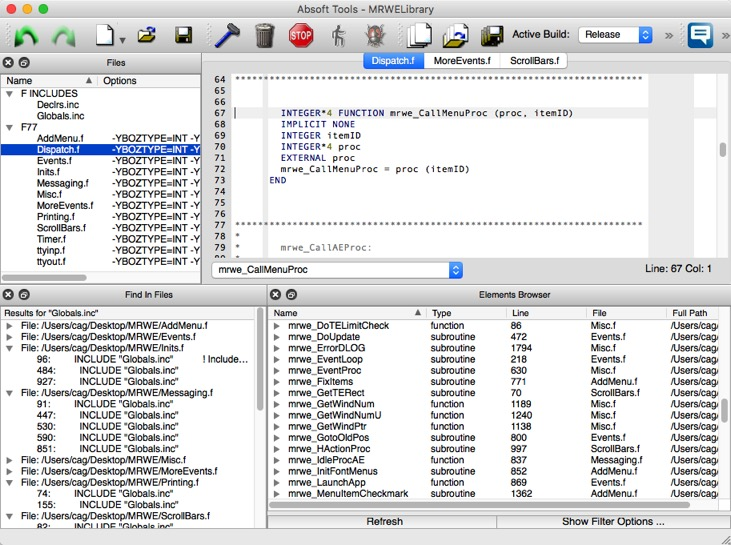 Absoft's Pro Fortran tool suite automates building extremely fast parallel code on multi-core systems. The Absoft Fortran IDE supports both Fortran and C and automatically provides proper syntax sensitivity, array indexing, etc. for each language. It includes everything you need: full Fortran 95 compiler with F2003 and F2008 features, programmer’s editor, Fx3 source level debugger, application framework, graphics and optimized math libraries in a single, easy-to-use package. Arguably the best fortran compiler for Intel macs are the Intel compilers ifort. offer an industry-leading C compiler, C++ compiler, and Fortran compiler, including optimization features and multithreading capabilities; highly optimized performance libraries; and error-checking, security, and profiling tools, allowing developers to create multithreaded applications and maximize application performance, security, and reliability. Run code significantly faster by taking advantage of the ever-increasing core count and vector register width available in Intel® Xeon® processors, Intel® Xeon Phi™ processors, including the latest Intel AVX-512 instructions. They can build pretty much any fortran code including very old fortran (as far back as fortran 66) and support the latest fortran standards. And in many people’s experience produce the fastest runtime executables. They also integrate directly into Xcode and tend to be the most up to date in terms of compatibility with the apple dev tools. They are also link compatible with both gcc and clang. ifort also includes a fortran version of their MLK library. They provide redistribute libraries for dynamically linked binaries, but they also support static linking, so in either case binaries can be distributed to people without the compiler installed. They aren't free on Mac (they are free on Linux), but the academic price is relatively inexpensive. Additionally they have a C/C++ compiler suite, but the performance gain over clang is no longer there. They are better than gcc in terms of codgen, however. So if you aren't using MLK there may be no benefit. The NAG Fortran Compiler (derived from the world's first Fortran 90 compiler which was developed by NAG in 1991) is robust, highly tested, and valued by developers all over the globe for its checking capabilities and detailed error reporting. The compiler is available on Unix platforms as well as for Microsoft Windows and Mac OS X. Release 5.3.1 has extensive support for both legacy and modern Fortran features, and also supports parallel programming with OpenMP. Given the move towards parallel processing it is useful to note that most of the compilers support OpenMP, OpenMP is a specification for a set of compiler directives, library routines, and environment variables that can be used to specify high-level parallelism in Fortran and C/C++ programs. If you have Homebrew installed then the easiest way to install gfortran is as part of gcc. I’ve written a page of instructions for setting up a Mac using Homebrew here. which should be an alias to "/usr/local/Cellar/gcc/4.8.3/bin/gfortran"
A couple of Fortran experts have contacted me and suggested I include these flags that are often very useful for developers. DALTON two powerful molecular electronic structure programs, Dalton and lsDalton. Together, the two programs provide an extensive functionality for the calculations of molecular properties at the HF, DFT, MCSCF, and CC levels of theory. Many of these properties are ONLY available in the DALTON2013 suite. GAMESS General ab-initio quantum chemistry package. Postg is a program that implements the calculation of the dispersion energy and related quantities using the exchange-hole dipole moment model. TINKER a general package for molecular mechanics and dynamics. Simply Fortran includes the GNU Fortran compiler, an advanced development environment including project management, and an integrated debugger for fast and easy installation, updated Oct 2017.
gXXforrtran is available on GitHub This package provides a “pgf77” script that emulates the Portland Group’s PGI fortran 77 compiler, instead using the Free Software Foundation’s GNU gfortran compiler instead. This emulation is sufficient to allow packages such as Gaussian03, that would otherwise require a commercial compiler, to be built using open source tools. Sourcery Institute a variety of resources for Fortran programmers, Sourcery institute tap for Homebrew formulae not in homebrew/homebrew-core, a Coarray Fortran Jupyter notebook kernel, forks of flang and gcc and OpenCoarrays a transport layer for coarray Fortran compilers.